This set of play money includes actual-size bills and accurately detailed coins. Children can work on identifying the bills and coins and learn how to make change using addition and subtraction skills. 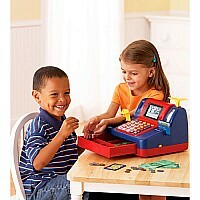 The money is perfect for use with our Pretend & Play® Teaching ATM Bank and other sets!